Home > EPL > latest news > manchester city > news > Must see! Manchester City's interactive tunnel cam is SICK! Must see! 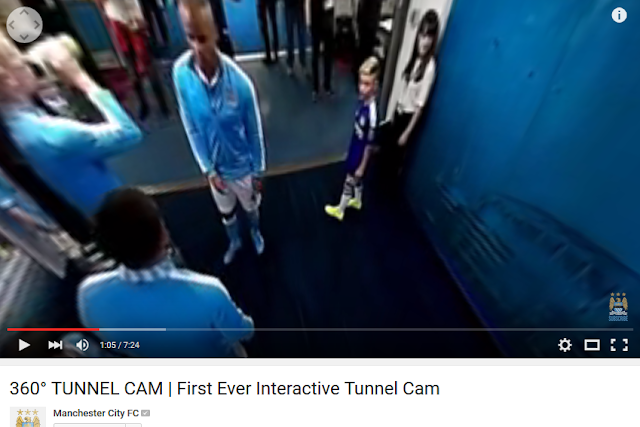 Manchester City's interactive tunnel cam is SICK! There are tunnel cams and we have Manchester City's tunnel cam. After the Chelsea victory, Manchester City youtube channel launched their tunnel cam for their fans to watch behind the scenes event in the tunnel before and during matches. The Manchester based club have made the tunnel cam interactive for fans as you can control the camera angle you which makes you the director of the cam. The 360° camera is also great to use on mobile phones and tabs as you just have to rotate your mobile to move the camera around. In the video below, you can watch the behind the scene of Manchester City 3-0 victory over Chelsea. Premier League Matchweek 34: Preview, Betting tips and Predictions - Who blinks first? Man City or Liverpool?